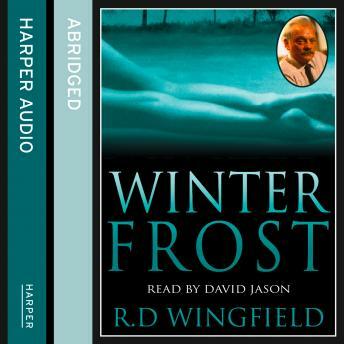 Winter in Denton is cold, bleak and a busy time for Detective Inspector Jack Frost, whose unsolved crime figures are mounting as he struggles to bring them down in the face of manpower shortages and budget cuts. Denton is currently having more than its fair share of crime. But Frost's main concern is for the safety of a missing schoolgirl. Nine weeks ago Vicky Stuart, eight years old, didn't return home from school and in spite of exhaustive enquiries and extensive searches, has never been seen since. Another little girl from the same school is reported missing. Her body is found... raped and strangled. Frost's prime suspect, strongly protesting his innocence, hangs himself in his cell, leaving a note blaming Frost for driving him to suicide. Subsequent evidence points to the man's innocence. Coarse, insubordinate and fearless, DI Jack Frost is in serious trouble.